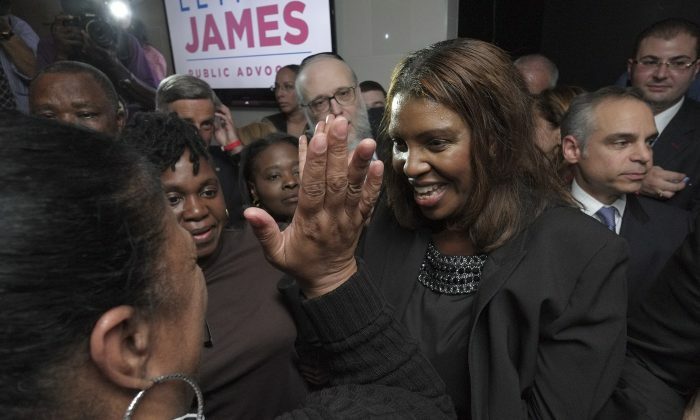 NEW YORK—The Letitia James victory in the Democratic public advocate’s runoff race Tuesday night was historic. Her victory almost assures she will be elected in the general election on Nov. 5 (the Republicans are not fielding a candidate). In that case, James will become the first African-American woman to hold a citywide elected post. But her victory also helped prevent a certain type of history from being made—having all white-males elected to citywide offices. For a city where whites make up a minority, 33 percent according to 2010 census data, this victory was huge. It will have ripple effects not only on the council she is exiting, but also on the body of elections for the next four years. The mayor’s race features Democrat Bill de Blasio and Republican Joe Lhota, meaning the highest post in New York City will go to a white male. The comptroller’s race pits Democrat Scott Stringer, a white male, against Republican John Bunett, who is a black male. Burnett is well qualified with years in the financial sector, but has had trouble raising money for his campaign after entering the race late and gaining little attention. Stringer benefited heavily from a hard-fought primary campaign with Eliot Spitzer, which boosted his name recognition. Stringer is heavily favored to win. James’s win will provide a little more balance in the racial and gender makeup of citywide offices, and alleviates pressure on City Council to base selecting its speaker on race or gender. Dan Garodnick, Mark Weprin, and more recently James Vacca, had all been perceived as possible candidates for the speaker’s role, but being white males required putting their names on ice while the public advocate race was sorted out. Melissa Mark-Viverito, Jumaane Williams, and Inez Dickens (whom current Speaker Christine Quinn has backed), were names closer to the top of the list in case James’s opponent Dan Squadron would have won. The City Council speaker will be voted on by the 51 members of the council in January. Much of the focus in the public advocate’s race has been on the effect it would have on the speaker’s race, but her election should also be factored into the mayoral race. James’s ideology matches very closely with Democratic candidate Bill de Blasio. During the final debate, she called de Blasio a very close friend, going so far as to call him “Mayor-elect de Blasio.” If elected, he will be a man she will be responsible for keeping in check. Current Public Advocate Bill de Blasio, who has great ideological differences with current Mayor Michael Bloomberg, has been kept busy in his role as the city’s ombudsman, keeping Bloomberg’s policies and practices in check. James said at the final pubic advocate debate it would not be an issue to call out de Blasio on policy issues, but did not elaborate on what that would look like if elected. Electing James to the public advocate’s post puts an outspoken progressive at the bully pulpit and will add to what is shaping up to be a chorus of progressives at City Hall. The city has seen a balance of a largely progressive City Council, mixed with a liberal public advocate and comptroller balanced with an independent mayor. The way the elections are shaping up, the city could see liberal progressive Democrats across the board, which would be a dramatic shift in the ideology that runs the city. NEW YORK—With Christine Quinn out of the race for mayor, Letitia James is the only female candidate in the race for one the city's top positions.